Last summer Southern Utah University’s Intergovernmental Internship Cooperative’s payroll was $2,174,000. This funded 244 internships for regional university students, who made $12-14 an hour, gaining valuable experience and professional development training in accounting, visitor services, biological sciences (like wildlife and botany), maintenance, cultural resources, and engineering. Interns lived in Iron, Kane, Garfield, Beaver, and Washington counties. They go to school at Southern Utah University, Dixie State University, and other schools in Utah. These internships successfully prepare students for careers after graduation and give them a debt free way to afford tuition. Many students are glad to learn and work in the lands they grew up exploring with their families. The IIC is a partnership organization funded by regional public land agencies who are investing in youth education. Participating agencies include the Bureau of Land Management’s Arizona Strip District, Color Country District, and Grand Staircase Escalante National Monument. The National Park partners include Bryce Canyon, Cedar Breaks, Grand Canyon Parashant, Great Basin, Pipe Springs and Zion. Three National Forest: the Dixie, the Kaibab, and the Fishlake, host interns and conservation crews. In addition the IIC partners with the Paiute Indian Tribe of Utah and the Kaibab Band of Paiute Indians, the State of Utah’s Southwest Region Division of Parks and Recreation, and Department of Workforce Service. Southern Utah University hosts the IIC and works with Dixie State University as an educational partner. 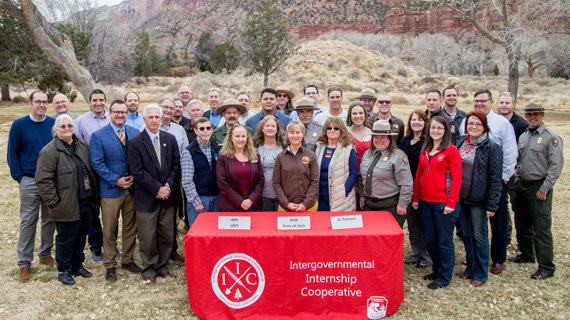 This partnership is renewed every five years, and the Memorandum of Understanding was re-signed on February 14 in Zion National Park. Agency staff become mentors to interns teaching professional processes, skills, and give interns valuable real-world experience. The IIC’s goal is to provide opportunities to develop a working knowledge about natural and cultural resources and a variety of careers in public lands while shaping the next generation of public land leaders and advocates. The IIC started 10 years ago and have employed over 1,500 regional youth. In a survey of the 2013 intern cohort, 47% percent of IIC alumni stated they still work in association with public lands. Eighty seven percent are working in a field related to their IIC internship, and 100% stated their IIC internship helped develop the skills/experience they needed to be successful in their current careers. The IIC is currently recruiting interns for the 2018 summer season. Please view our website for more information on available regional internships: iicinternships.com.